Tasked with an impossible mission, hunted by the very people he wants to protect, Yanko White Fox is the only one who can save his nation from famine and anarchy. Armed only with his fledgling skills as a wizard and accompanied by allies he’s not sure he can trust, he must track down an ancient relic before his enemies find it first. But countless obstacles stand in the way, including his mother. The deadly and infamous pirate Snake Heart cares nothing for the family—or the son—she abandoned, and wants the artifact for herself. Snake Heart is my favorite fiction book so far in 2016. I know that the year is still young but I have already read a LOT of books. I have definitely read a huge number of books between Warrior Mage, the first book in the Chains of Honor series, and Snake Heart. Reading Snake Heart reminded me that I truly love the Chains of Honor series; possibly more than any other series in Lindsay Buroker's fantastic collection of books. Since I keep coming back over and over again to read Buroker’s books that says a lot. I love her world building and her characterizations. Buroker also has a great sense of humor (I think that I say this in every review). As opposed to The Emperor’s Edge series, which exists in the same world but whose heroes are Turgonian we are given Nurian heroes. It is hard to pick a side to cheer on when you love both sets of characters but since I claimed this as the series that I like most... I guess that this means that I am on team Nuria. Yikes… flashback to the days of Twilight. There are so many great characters to love. I can usually dial down on my favorite but there are a few extras that I have had to give a nod to as well. Kei is back, and will remain my favorite as long as he remains within the pages of a story. I’m going to state that what Hemingway has to say in the quote below also applies to parrots. Dak comes in second. Though he may be scarred by battle and the happenings in his life, which are just beginning to get fleshed out for us, it is evident that there is much more to him than his warrior abilities and the wounds of his past. He is wise and he shows himself a loyal friend even though his goals are often in direct competition with Yankos. Dak is a character that I would enjoy getting to know better. I hope that he is expanded upon more in book three. In my review of Warrior Mage, I mentioned that I wanted to get more of Pey Lu, Yanko’s pirate/mage mother who left Yanko and his family behind when Yanko was vey young. We definitely learned more about her and saw her in action in Snake Heart but I am still craving more. My hopes are again on book three for a greater chance to know what makes her tick. 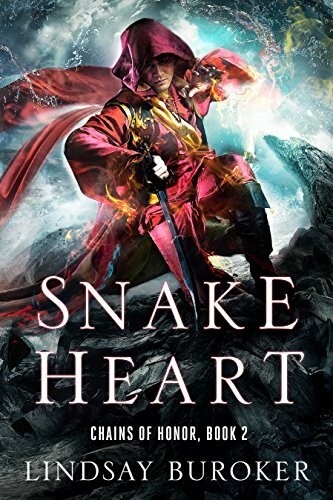 Snake Heart is a win win for me and the ending left me desiring more. It’s a long wait until the fall for book three but it is worth waiting for.